The “Avios Redemption University” series is a good starting point for beginners, although I hope everyone will learn something from them. Click here to see the other articles. This article explains how to earn and redeem Avios on Flybe. It is now over three years since Flybe abandoned its own reward scheme and adopted Avios as its reward currency. A lot of people still do not seem to know that the partnership exists, especially when it comes to redeeming Avios points on Flybe. Flybe has its own FAQ if you want to know more than I cover in this introductory article. Whilst this series of articles is primarily about redeeming Avios, I want to quickly run over how to earn Avios when flying on Flybe – because, as usual, it is unnecessarily complicated. You can only credit a Flybe ticket to avios.com and not to British Airways Executive Club or Iberia Plus. Because you can only earn points in avios.com, earning Avios on Flybe is restricted to residents of the UK, Isle of Man and Channel Islands because those are the restrictions on who can have an avios.com account. In reality, Irish resident of Aer Club and Spanish residents of Vueling Club should also be able to earn points by quoting their membership number as that is, technically, also an avios.com account. The cheaper ‘Just Fly’ and ‘Get More’ ticket types on Flybe earn 2 per £1 / €1 spent. ‘All In’ flexible tickets earn 4 per £1 / €1. As well as the base fare, you can also earn Avios on whatever you pay for hold luggage, standard and extra leg room, preassigned seating and Flybe Flex. However, you will not earn anything on ‘Government charges’, primarily APD. On routes where Flybe and BA compete at London City, you are likely to earn more Avios taking Flybe given that the cheapest British Airways economy tickets only earn 125 Avios! You won’t earn tier points on Flybe however. There is an impressive catch if your points do not post. You can only claim missing Avios between 30 and 40 days from when you took the return flight. Claims made before 30 days, or after 40 days, will be dismissed. Where I can I fly from with Flybe? If you live in the UK regions, yes. You can fly from Durham, Humberside, Gatwick, Newcastle, Southampton, Belfast City, Glasgow, Heathrow, Stornoway, Bristol, East Midlands, Inverness, Leeds Bradford, Southend, Manchester, Anglesey, Doncaster Sheffield, Edinburgh, Guernsey, Isle of Man, Stansted, Norwich, Wick, Exeter, Jersey, Liverpool, Birmingham, Cardiff, Kirkwall and London City. 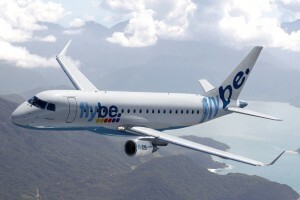 Flybe flies to over 85 airports across Europe in total. The full route map is here. What is the key thing I might not know? Availability on avios.com and ba.com does NOT match. You should check both sites if looking for a specific flight. Avios.com availability is better. What else was I never told? You receive one free 23kg suitcase when booking an Avios redemption on Flybe at avios.com. A standard cash ticket on Flybe does NOT include any luggage. This means that the value of a redemption varies depending on whether or not you would take a suitcase. If you book at ba.com the booking process states: “Hand baggage only fare. No checked baggage allowance.” However, this is an IT error and you will receive a free suitcase. If you are nervous about trusting this, book on avios.com where it is clear that a suitcase is included. The same rules apply as for other partner airlines. Flights under 650 miles per leg will cost 4,500 Avios per leg and flights up to 1,150 miles will cost 7,500 points. There is no ‘off peak’ pricing available – all dates are priced as peak dates. Yes at ba.com – although availability is worse. No, at iberia.com. Reward Flight Saver is not available with Flybe so you are looking at a higher ‘taxes and charges’ figure than you would get from British Airways. On the other hand, flights from regional airports can often be pricey due to the lack of competition. Let’s look at a couple of typical redemptions. All three Flybe flights are available in both directions on avios.com and ba.com. A ‘Just Fly’ ‘no suitcase’ ticket would be £181.82, picking obvious weekend away flight times. The ‘Get More’ price with luggage would be £238.82. An Avios redemption is 9,000 Avios plus £54.09 tax. Without a suitcase, you are getting 1.4p per Avios which is good. With a suitcase you are getting 2.1p which is really good. All three outbound and the one inbound flight were available for redemption on avios.com. NO flights were available for these dates on ba.com. A ‘no suitcase’ return ticket, assuming you fly Friday evening and return Monday evening, would be £112.99. With a suitcase, you would pay £169.99. Without a suitcase, you are getting 0.65p per Avios which is not great. With a suitcase, you are getting 1.29p. This is quite good. There is less value in redeeming your Avios on Flybe if you are a ‘hand baggage only’ traveller although you can get a decent deal as the Birmingham to Paris example shows. You DO benefit from the option to cancel and get everything back less £35. This may make the Avios option more attractive than a cash ticket if you think your plans may change. With a suitcase, the Avios option is clearly more attractive. Whilst I only looked at two examples here, the results are in line with all of our other tests of Flybe pricing over the last three years. If you want to know more about Flybe’s participation in Avios, their Avios page is here and there is a FAQ here. The only Flybe flight I’ve taken didn’t credit the Avios and by the time 30 days had came around I’d forgot all about it. Having a 10 day window to claim is ridiculous. The above was for a booking for myself crediting to an avios.com account in my name. Funnily enough when this partnership was first announced I got a friend who didn’t care about loyalty schemes to try putting my Avios number in their booking and the points for that DID post! I don’t think that was supposed to happen. If your friend’s flight was first, their system may have rejected your Avios number on the grounds that it was already associated with a different name in their system. Which would sort of be fair enough. I am a fairly regular FlyBe user. I find that I have to claim for missing Avios with them more often than I don’t. I can’t see that I’m making any errors in the booking and check-in process. My contacts with customer service asking why this keeps happening have always been unanswered, so I presume the error is with FlyBe. I make a diary note to check for Avios on 30th day. Due to frequency of their error, I think the 10 day window after 30 days to be ridiculous or even worse! I think I’ll follow your advice and set a calendar reminder for 30 days on the rare occasions I may have to use Flybe. I think its fair to say their IT setup is a bit of a shambles currently. They are investing though – https://www.travelagentcentral.com/transportation/amadeus-partners-european-regional-airline-flybe but it will be a while before we see the results of this. Anyone who has tried to use the Flybe app will know what I mean! Current subject notwithstanding, I thought your readers would like to know that yesterday afternoon I returned from my eighth & final tier point run to Tallinn, via Helsinki, all of them booked over a year ago when the business fare was a mere £232 return. So for £1,860, plus a night each time in the cheapest old town hotel I could find at the time of booking, I’ve earned 1600 TPs. I have to say that the whole experience was an absolute pleasure. Not only is Tallinn – specifically the old town – a beautiful & interesting place, full of welcoming, friendly locals, the Finnair experience was also pretty special. Their first class lounge at T3 is excellent and the cabin crews each time were, without exception, calm, friendly & professional, creating the perfect atmosphere on board. Their A350 is pretty amazing too, which is why I always tried to book the 10.20 departure out of LHR. Unfortunately the decision by BA to continue their direct Tallinn service during this winter put paid to the £232-via-Helsinki fare for good, so I’m just glad I had the foresight & freedom to book as many of those forward trips as I could. Here’s to my next tier point runs being as pleasurable and financially-doable as my Tallinn ones were. The Hilton in Tallinn is excellent and always got a bargain and a nice upgrade for being a diamond member. Even without the bargain fares I’ll be back there. I did sleep in the airport pods one night though! So you’ve paid £1860 plus 8 x nightly hotel costs to get BA status (and had 8 x single night holidays into the bargain!) ? Can I ask, do you think you’ll get equivalent value back from having BA status? To me, this seems quite an expensive way to achieve it. Well, N.Ford has achieved BA Gold in a more expensive but (in my opinion) healthier way than those FlyerTalk TP runs – 8 flights in 72 hours not including the positioning ex-EU flights. 8 (EIGHT) times to Tallinn? Yawn. Plus the Avios / Hotel rewards points earned on the stays. Not sure you will get the value back but the trips can be an experience in themselves. Good or bad. Personally I would rather visit as many places as possible while meeting my TP goals. Not if you like Tallinn and like Finnair A350s! Except it potentially makes sense. Assuming he is half-way through his membership year he gets 21 months of Gold PLUS 12 months of Silver. So, 33 months of status. Benefits like Gold Priority Rewards have a lot of value on top. Clearly you have to like flying and travel (and Tallinn) to do this, but if you do then why not? There were times in my life when I was lounger when I might have done the same when I was single. Are these refundable? i.e you get your points + taxes back? Can’t see that mentioned in the article. Sorry, just noticed you did mention it at the bottom. Apologies. We flew with Flybe last summer, my wife received 143 Avios and I received 215 on the same one-way flight. We were on the same booking, travelling with one infant and one child. Was I credited the Avios of the child, explaining that I received more Avios than my wife? Please share any experience with this; I don’t find it fair that childs cannot earn air miles with Flybe as they are paying the same fare as adults. Fees on IOM-BHX-IOM are £ 61.97, apart from the points. Flybe’s Avios redemptions are not easy to find and in some cases are non-existent. As a frequent Channel Island visitor I have managed to redeem Southampton – Jersey with good availability, but I defy any reader to find a single example of Southampton – Guernsey….they simple do not offer Avios redemptions on those flight. I check this regularly and last week complained in writing to Flybe. Their response? So, they deliberately ignored the main complaint and simply responded that (the extremely poor value) “part pay with miles” was an available option. I realise that the Guernsey route is a “Blue Islands” franchise so I guess this is “Blue Islands” refusing to make the flight available but as well as me it must be infuriating for Guernsey residents to be able to earn Avios in a reward system they cannot take full advantage of. Note Flybe flights to Stornoway and Kirkwall from Glasgow will be discontinued from 4th March, these are now operated by Loganair. I’m so glad Loganair got away from that awful setup that is Flybe. Be interested if anyone has any tips of exciting flybe destinations… are there any Scottish island routes remaining that can be redeemed on avios? Depends where you’re starting from, but from Birmingham for example: Milan, Amsterdam, Chambery, Bordeaux, Dusseldorf, Berlin, Jersey, Guernsey, Hannover, Hamburg, Knock, Isle of Man, Inverness, Paris, Stuttgart, Geneva. Loganair flies to most of the Scottish Islands groups and has a codeshare with British Airways so presumably you could use avios. No you can’t unfortunately. Even for cash, the BA codeshares are only bookable when linked to a BA mainline connecting flight. I’m flying from Prague to Southend this summer with FlyBe. The base fare without taxes is €3. Does this mean I’ll receive a whopping 6 avios? How many were you expecting on a 3 Euro fare?! While I appreciate avios are only earned against the base fare, the actual total fare paid will have been A LOT more than 3euro! Flybe are horrendous for arriving at ridiculous ‘fees/taxes’ thus making redemptions generally nonsensical. All a bit pointless anyway as the merger of BAEC onto the Avios platform is now shockingly going to happen after many years delay. Just redeemed for TXL-BHX. GBP26.40 + 4500 avios. Very happy as cash fare was > GBP 300. Wasn’t able to select a seat though. Flybe’s system kicks it out.